To test, the general area around the chassis is checked with a temperature gun, with the average temperature recorded. Once that’s established, the PC is turned on and left to site idle for ten minutes. At this point, we open AIDA64 along with 3DMark. We then kick-off a full suite run, and pay attention to the Kill-a-Watt when the test reaches its most intensive interval (GT 1) to get the load wattage. 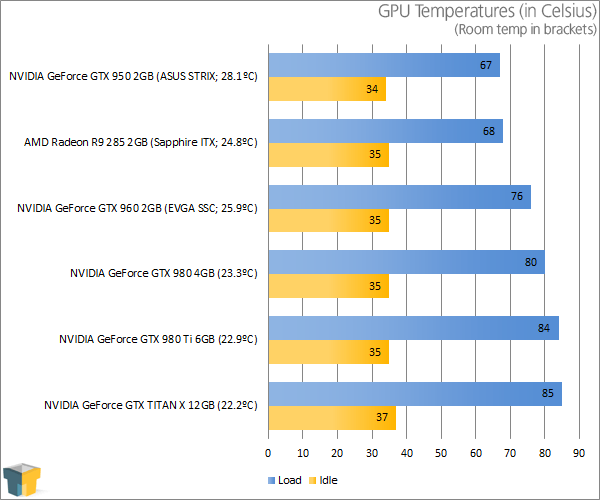 The GTX 950 STRIX is the lowest-end card I’ve tested in our updated test platform (which will result in a full-blown GPU test suite overhaul in the near-future), so it’s no surprise that it reigns supreme in both the temperature and power consumption tests. While the GTX 950 falls a bit short of the R9 285 in performance, the efficient Maxwell architecture shaves 50W off at load – an impressive feat. Based on the model name alone, it’s not hard to sum the GTX 950 up. It’s of course slower than the GTX 960, which gives us the idea that it could handle 1080p gaming with good detail levels – and that’s just what we get. 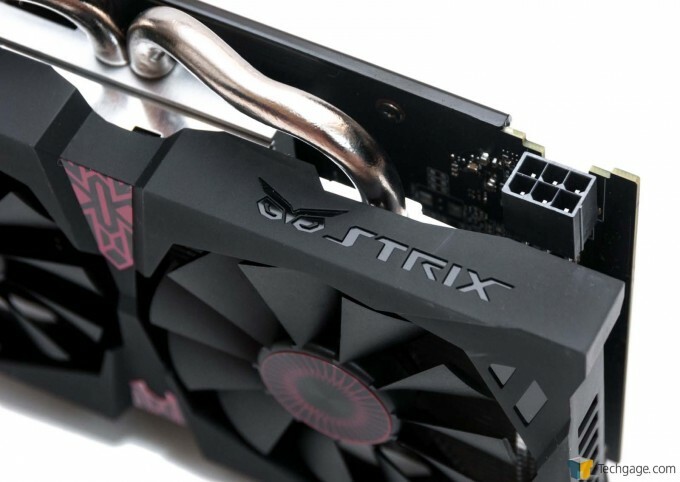 In all of our testing, the GTX 950 soared past the GTX 750 Ti, but that’s of no surprise. It’s clear why NVIDIA wasn’t able to design this card without a power connector – it’s just too powerful, and it’s hard to complain about that. In some cases, it could be upwards of 50% faster; in most, it’s closer to 33%. In all cases, AMD’s Radeon R9 285 was faster, and as of the time of writing, it’s actually $5 cheaper if you want to take advantage of a mail-in rebate. Typically, though, the card is closer to $180 after mail-in rebate. The R9 285’s successor, the R9 380, retails for as low as $200 – in that particular match-up, the GTX 950 is highly desirable. That’s especially the case when you realize it will draw up to 50W less while gaming. Again, the GTX 950 is just what I expected, and that’s far from being a bad thing. We’re dealing with a $160 GPU that can blow away the kind of gaming you’ll see on consoles; which is to say 1080p and 60 FPS in every single game you want to play – and probably with better quality, too. In case you’re wondering where all of our AMD 300-series reviews are – don’t fret, we’ll be cranking some out soon. Great 1080p performance without sacrificing game detail. 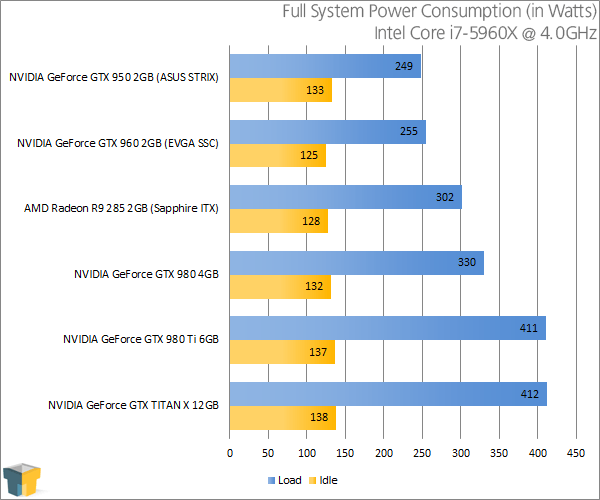 Runs cool (at least our STRIX model does) and is very power-efficient. GeForce Experience offers numerous useful perks. ~$160 is a good price for what’s offered. 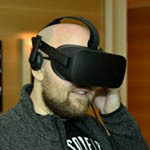 A 2GB framebuffer could be limiting in SLI.